Hello from Haiti! I realize that almost a month has passed since I published our last article. The last two weeks we’ve been busy, busy, busy with visitors coming and going. We’ve had a wonderful time. Because of problems with our internet, I am writing from the Picolet Hotel. So, even now I’ll have to be brief. But, I didn’t want to let another day go by without updating our Rehoboth site. Jerry Norris, (Sierra Vista, Arizona), a longtime supporter of Rehoboth Ministries, visited us here in Haiti for the first time and was the guest speaker for our Easter Sunday morning service. Jerry and his wife, Judy, have been consistently supporting this ministry for over twenty years, yet we had not seen them for much of that time. It was so wonderful to catch up on each others’ news and we had fun showing Jerry around our ministry sites so he could get a firsthand look at all that he and Judy have been faithfully contributing to all these years. Thank you, Jerry, for coming to see us and for sharing your testimony with our church members. Your visit greatly encouraged us in the Lord! and Nathan came all the way from Kansas City, Missouri, which we learned is in the dead center of the United States map. After some very powerful meetings together, we were all asking the Lord for More, More, More! We were tremendously blessed by the impartation that came through their ministry. This coming weekend, we have a group of ten people flying in from the Orphans Promise Ministry. What a celebration this is going to be! The team will be sharing in our Sunday morning service. On Monday, there will be a dedication of our brand new kitchen, (which they built for our ministry), then they’ll get a firsthand look at our students as they rejoice over a hot meal. 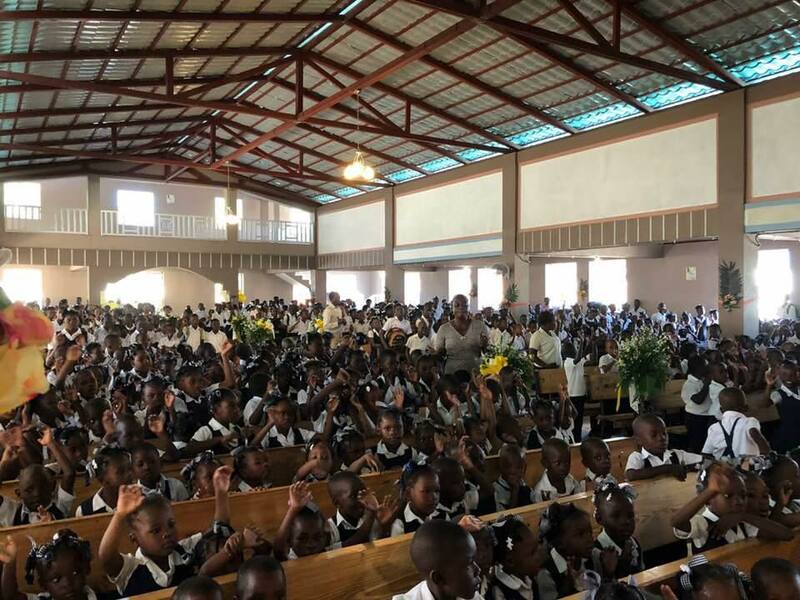 In fact, Orphans Promise had 200 boxes of food sent to us from another ministry in the south of Haiti so that we could get a good head start before they arrive. Thank you, Orphans Promise! We are so excited that Richard and Linda Baker, (friends that go all the way back to our sending church in Tarboro, North Carolina), will be coming with the team. They are also faithful supporters who have been a lifeline to Rehoboth Ministries for many years. Many thanks to those visitors who have come and to those who are on the way! This entry was posted in Uncategorized and tagged Good news and bad news are the stuff of life. You can read about both in today's post., orphans promise.org by Rehoboth Ministries. Bookmark the permalink. Wondered why I haven’t heard much from you lately! Now I know why. Busy little bee! Excited about Orphan’s Promise!